Hello! I’m Sarah Humphreys – known on Instagram and other places as @edwardandthewhitebear - and I’m delighted to be Quilter #6 for 2018 on 52 Quilters. February’s theme is Creative Meditation: finding your voice and discovering who you are as quilter. I’ll be thinking about that all week on Instagram (and perhaps a later blogpost) but to begin with – a little bit about me. I live in Yorkshire, in the UK. I’m 40 years old and have quilted most of my life, having grown up in a crafting family. For as long as I can remember I was encouraged in embroidery, sewing, knitting – as a child, boredom was not an option! But by 13 the enthusiasm had waned and I was in the midst of a lengthy period of teenage angst. My mother had started to attend a local quilt group and she convinced me to accompany her to see a talk about a quilt depicting women’s work in medieval times. She got me to go because of my interest in feminism and women’s history, but I was captivated by the wonderful quilts I saw and the women who made them were so welcoming and encouraging. I was given advice, support and bags and bags of fabric to get me going. I started my first quilt soon afterwards and found that when I was sewing, all the difficult things about being 13 faded away. And I’ve been making quilts ever since!! My first quilt! - It's all hand pieced over papers (English Patchwork) and (minimally!) hand quilted. So my start in quilting was certainly apt for this month’s theme of ‘discovering who you are’ – I discovered as a teenager that I was a quilter and a maker - and fabric was destined to be an important part of my life forever. Over the years I have attended many evening classes, workshops, quilt groups and retreats. Most of what I have learnt about quilting has come from being around other makers – quilters are amazingly generous when it comes to sharing skills and ideas (and fabric). So many have inspired and challenged me to develop my creative skills. Equally, so many have offered the hand of friendship, particularly at points of change in my life. Which is what has led me to where I am today – I still love making quilts, I sew virtually every day, and I now teach patchwork and quilting to others. Queens of British Fashion celebrates three amazing British designers - Mary Quant, Vivienne Westwood and Katharine Hamnet. Although I love to work in many different styles, I consider myself predominantly a modern quilter these days. I like to make big quilts - and I adore free motion quilting. More about that later in the week too! Office Doodle 1 - and me! 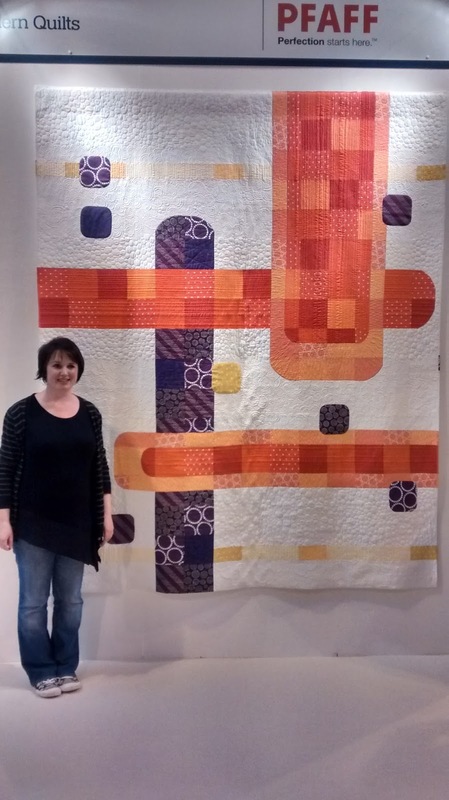 Winner of the Festival of Quilts Modern Category 2016. 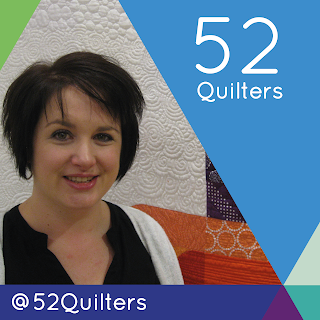 I hope to get to know lots of new quilters this week - please do say hi on the Instagram account! Someone asked me to talk a little more about working from home and working for myself. I will preface this by saying: I am self-taught in every aspect of this, from sewing to the taxes, etc. So please don’t take this as an all-encompassing, completely accurate guide. Years ago, I had a real job, outside of home, and I hated it. I was miserable, so I quit; Walked out while on a break. I just couldn’t take it anymore. Ever since then, I have been self-employed. It’s varied between full-time and part-time, and I have had a couple jobs outside of the home here and there, but for the most part, I’ve worked as a seamstress for the last 18 years. I started making custom prom and wedding dresses, and loved it. I had been making my own clothes for years, so was comfortable with patterns and designing. Eventually we decided to find a sewing genre that would allow us a little more privacy (my sewing studio was a room on the front of our house), and I stumbled onto production sewing. I started out making bags and purses for several local companies (freakinbillboard.com); later I added on wallets (thriftyzippers.com), and eventually fish bags (used in fishing competitions). 1. You must be a self-motivated person. I struggle with this at times. I am an all-or-none person: I either spend the whole day scrubbing every inch of my house, or I go weeks without doing any cleaning at all. It’s hard for me to find balance. I’ve really had to learn balance in sewing. I love that I have a flexible schedule, I just have to be careful that I don’t allow it to be too flexible. 2. You cannot be afraid to fail. I have not always been as busy in work as I am now, and we’ve had to adjust our lives to accommodate. I have a great husband who puts up with me, and we’ve made it through the lean times. 3. Perfectionism is both a blessing and a curse. When you’re sewing for a client, you want to put your best work forward, of course! But you can’t take so long making something for a client that it’s not even worth your time. So either put aside the perfectionist in you, or get faster. Either of those options take time and patience. 4. Calculate the cost. As makers, we often undervalue our work. It’s hard to put a price on something we’ve poured our heart and soul into, but when it comes time to price it, we don’t usually want to put the real price on it. Don’t cheat yourself! When you calculate how much that quilt should cost, include everything like fabric, batting, even thread, needles, and the upkeep on your machines. And don’t forget to pay yourself! Figure out how much you want/need hourly, then add that cost into the price of whatever you’re selling. 5. Find your niche. Long arm quilting services? Quilt maker who sells at local fairs? Tailor? Production seamstress? Find out what you enjoy or what you’re good at, then do the research. Talk to people. Ask questions. Make lists, budgets, schedules, business plans. And if you find that one thing isn’t working, don’t be afraid to back away and switch gears. That being said, don’t throw a ton of money into something before you know it’s gonna work for you. Can you rent the machine before you buy it? Can you work at it part time before leaving your current job? Can you afford it if it fails? 6. Reach out. Use whatever resources you have in your area to find work. Take fliers to local quilt and fabric shops. Go to local dry cleaners (if they don’t have in-house tailors, they are probably happy to find one because their customers are asking). Use online sites such as Craigslist to find people who are looking for seamstresses. Keep on it. 7. Treat your business as an actual business. Use contracts with your clients; it’s a protection for both you and them. Learn your local tax laws (in the US, self-employment means you pay a much higher tax rate than just what your employer takes out of your check for you) so you can save back and be prepared. I feel incredibly fortunate that my mother taught me a skill that I’ve used for so long to help support my family. I love being home with our son, and I wouldn’t trade it for anything. I have never said “I don’t know how to do that”, I’ve just acted like I did and figured it out later! Saying “no” brings inner peace. When I tell people that I work from home, usually they think (or sometimes say!) “oh! What a nice hobby!” In reality, it’s a full-time job that I am just lucky enough to be able to do from home. But that also comes with some sacrifices. I also homeschool our son. Working from home allows me some flexibility in my schedule. If I need to take some time from sewing so I can get something else done, I usually can. But it might mean that I’m up working at two in the morning to make up for lost time. Would I trade it for anything else? Nope. Have I had to learn how to balance my priorities? You bet. I think that’s one of the most important lessons I’ve learned: how to say “no”. Not just learn HOW to say it, but actually follow through and say “no” to friends and family despite my inner voice trying to convince me that I can squeeze it in. On a regular basis, someone asks me if I can hem something for them (my dad last week), or make them a dress (call from old friend yesterday), or mend their jacket (last month). In the past, I would have agreed to help, usually for free, and then regretted it. So I’ve learned to politely decline (except my dad, he’s the only one. And he’s also patient and understands how busy I am). I’ve also had to learn to say “no” to myself. I see so many amazing things on Instagram and Pinterest and want to make them ALL. I want to enter every competition, every swap, make every pattern! But I know that’s not possible or practical. This year, I’ve decided not to do any swaps that involve sewing (I am doing a fabric swap).